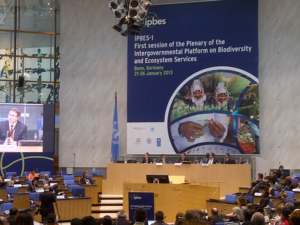 A group of business representatives from the International Chamber of Commerce (ICC) has joined the first session of the Inter-governmental Panel on Biodiversity and Eco-System Services (IPBES) taking place in Bonn, Germany from 21-26 January, hosted by the Government of Germany. Inspired by the Intergovernmental Panel on Climate Change, an international body for the assessment of climate change established by the United Nations Environment Programme (UNEP), this new UN body brings together international governmental and non-governmental institutions from over 100 countries with the aim of building capacity for and encouraging the use of science in policy-making. The panel hopes to bring together leading scientists tasked with the responsibility of collecting credible, scientific information, in an independent manner, in order to enable the Intergovernmental Platform to fulfill its mission. The ultimate goal is to drive policies that would serve as a basis for decisions in major multilateral environmental agreements, national governments and to inform other decision-makers. The potential outcomes of this new forum could influence investment and planning decisions for companies across sectors, e.g. through metrics and accounting systems dealing with biodiversity and ecosystem services, including valuation and cost-benefit analysis. Martina Bianchini, Chair of the ICC Task Force on Green Economy welcomed IPBES’ aim to strengthen the science-policy interface. The need for indicators, metrics, accounting measures and better disclosure and reporting needs to also make sense in economic terms. Including externalities is critical in the long-term to operationalize a “green economy” as outlined in ICC’s 2012 Green Economy Roadmap. This ICC guide for business, policymakers and society sets out ten conditions needed to drive sustainable growth and calls for innovation, collaboration and governance. It serves as both a tool for integrating sustainability into business strategies and government policies, and a platform to share and scale-up best practices, and initiate new activities. ICC will continue to contribute to the IPBES through its green economy and biodiversity working bodies and help ensure substantive input via its global network of experts. Download the ICC Green Economy Roadmap.